The Progression & Achievements module is a game related module designed to help you organize and display the raids you have completed in some of your favorite games. Depending on the game you choose, this module will display each boss in a list style next to either a dash (representing an incomplete raid) or a green check mark (representing that this raid has been completed). Other colors may be present as different games have multiple levels of difficulty (see image at bottom). If you have not already, please create this module by navigating to your admin panel > modules tab, and creating your new "Progression & Achievements" module. Once this module has been created and opened, you will notice your first option which will be to choose your selected game. By selecting your game, a list will be provided of all of the different bosses within this game and type. Check off each raid as you see fit. If you don't want to display certain categories of bosses, simply click the image of the eye next to each category title. Levels of difficulty for each raid will also be provided for the supported games. 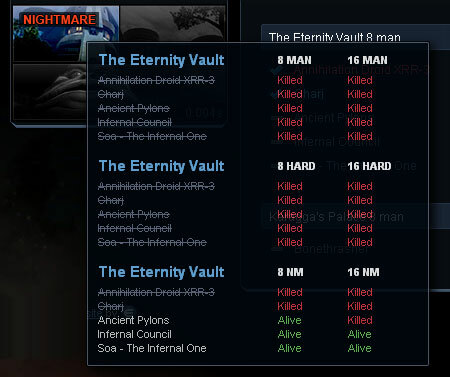 For example, if you are using SWTOR, bosses will be displayed with normal, hard, and nightmare checkboxes for you to choose which has been completed. As stated above, if your game is not listed within the dropdown, don't fret. By choosing "custom" you will have the opportunity to create your own progression list and even categories within it. Selecting custom allows for all of the options above provided to the other games, but even more customization as you can now set the name for each raid.